Millicent Omanga, Jubilee nominated Senator, has hit the headlines for allegedly getting involved in the Ksh 4.8 billion gun supplies scandal at the Kenya Prisons. The Kenya Prisons Department which is under the Interior Ministry had issued an authorized tender with no bank or tender performance security guarantee. Ethics and Anti-Corruption (EACC) rushed quickly and protected the country from the offing of another multi-billion theft just when the money was to be released for the supply of security items in a flawed tendering process, reports The Standard. Investigations into the matter are being finalized and they are unearthing a plot wherein the Senator and some other individuals almost staged a theft that could have robbed the country billions of shillings days after the infamous dams scandal. EACC boss Twalib Mbarak said the scandal was detected and stopped just before the money was transferred from the Ministry accounts to the supplying firms’ accounts. Omanga is the founder and managing director of Milways Enterprises which deals in construction, import of furniture and electrical appliances and was to supply G3 slings valued at Ksh200 million. Suspicions were, however, raised given that all guns came with slings attached to them. Also, the slings prices were exaggerated from Ksh200 to Ksh5,000 per piece. Mbarak also communicated that the contracts were awarded without following set procedures, they flouted rules by committing payment of 80 percent upfront within 30 days before the supply of items. Investigations also revealed that the Milways Enterprises entered the transaction without valid Pin and Tax compliance certificate and forged Local Purchase Orders (LPOs). Others that are under investigations alongside Senator Omanga are the Post-Training and skills development Secretary Alfred Cheruiyot and former Sports Principal Secretary Richard Ekai. The two will be facing charges of being responsible for an attempt to release Ksh3.6 billion for payment before the delivery of the weapons. Last week, the president issued a stern anti-graft statement stating he is out to tackle the vice without fear or favour. He also labeled corrupt officials ‘enemies of the State’. 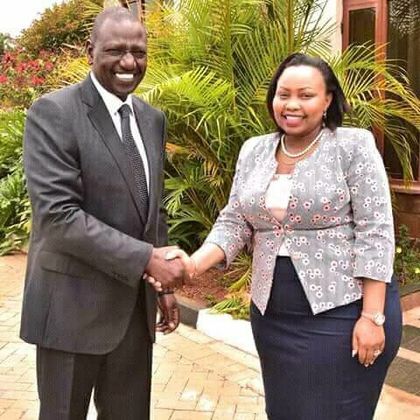 Reports believe that Deputy president Wiliam Ruto met her in 2013 and appointed her to be a director of the Kenya Electricity Generating Company (KenGen). Omanga is said to have been trying to make ends meet in Nairobi by selling bed sheets at the time. The corruption cases accompanying Jubilee and Ruto specifically have moved Siaya Senator James Orengo to try impeaching Ruto for gross misconduct.